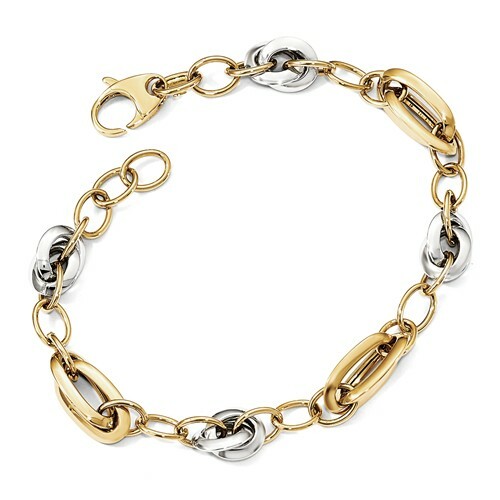 This high-polished Italian-made fashionable designer link bracelet for women is crafted in 14k two-tone gold with big designer yellow and white gold links in between round yellow gold links make this a unique and trendy women's bracelet. Bracelet measures 7.75mm wide and is an 8" length (will fit those with 7" also, because of the over-size links). Bracelet weighs approx. 4.35 grams of gold. Includes a secure, lobster-claw clasp. We guarantee our Italian Design Link Bracelet for Women in 14K Two-Tone Gold to be high quality, authentic jewelry, as described above.